Green Kitchen Stories is an utterly gorgeous blog. Its food philosophy is technically vegetarian, which may seem like an odd fit given my (avidly) omnivorous preferences, but the creators David and Luise have crafted a site full of unusual recipes highlighted by beautifully-composed images full of visual drama. Some of my favorites posts include the Green Breakfast Bowl, Warm Autumn Tart and Borscht Beetroot Soup. But let’s be honest, here: my favorites are always the desserts! So I was excited to see the release of an app by the Green Kitchen Stories team devoted entirely to the sweet side of life. 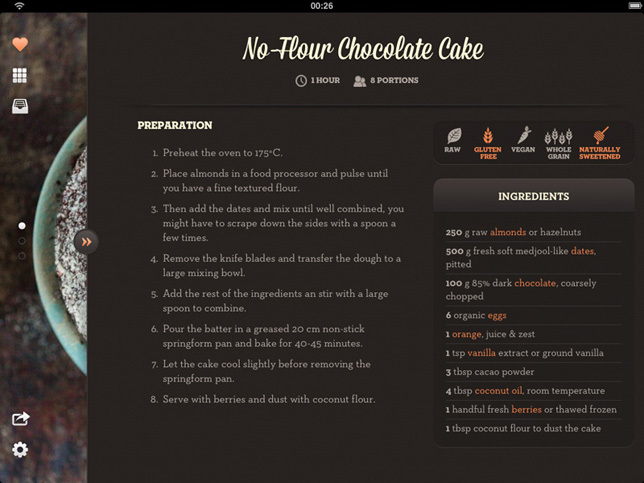 Called Healthy Desserts, the app is available for iOS and features stunning and user-friendly layouts. It looks fantastic on my phone… I can only imagine how wonderful it would be on an iPad. The recipes (48 total) come in categories like Cookies and Nibbles, Cakes, Muffins and Cupcakes, Fruit & Berries, Brownies & Bars for quick browsing. 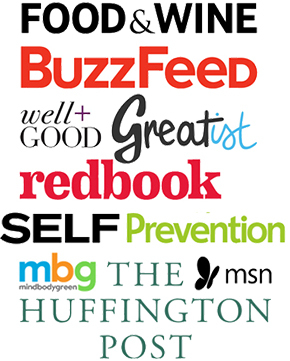 Or you can simply access the grid of deliciousness on the homepage and see where inspiration takes you. 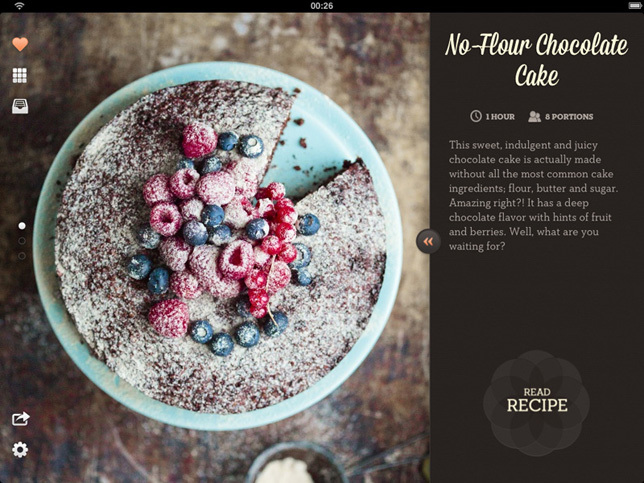 On my list to try is the No-Flour Chocolate Cake, Flower Power Cake (a definite favorite from when it appeared on the Green Kitchen Stories site!) and the Swedish Saffron Buns. Although grains and beans do surface in some of the recipes, many others use almond flour or other grain-free substitutes. If the team ever releases Healthy Desserts 2.0, however, a sort function would be very useful. The individual recipes are already tagged with raw, gluten-free, vegan, etc. but I’d love to know at a glance which recipes require less modification due to being gluten-free, or which will take me on less of a blood-sugar roller-coaster due to being naturally sweetened. One that note, let me present a paleo carrot cake. 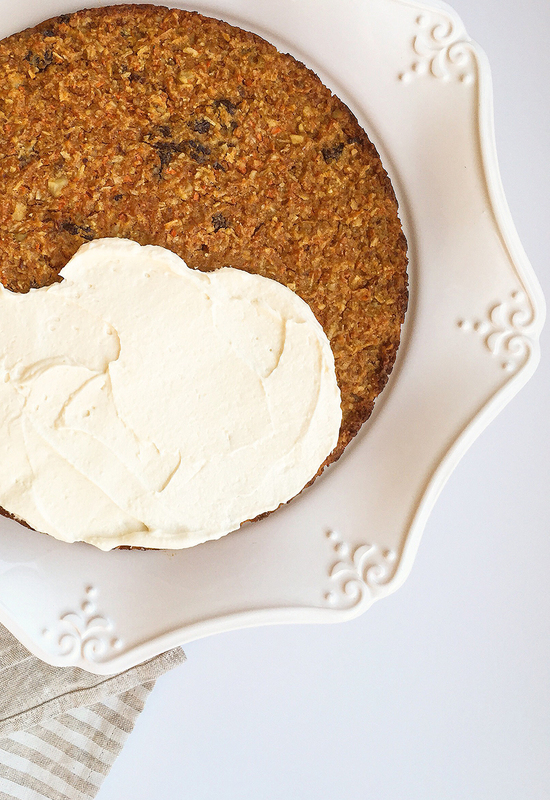 It’s a version of one of the earliest recipes to catch my eye after downloading the app: A Healthier Carrot Cake. I took David & Luise’s brilliant concept of a naturally-sweetened cake packed with carrots, fruit and spices and riffed on it with a grain-free flour combination and subtle other tweaks of my choice. I kept the simple, striking styling from the Green Kitchen Stories but added a dash of cinnamon for good measure. 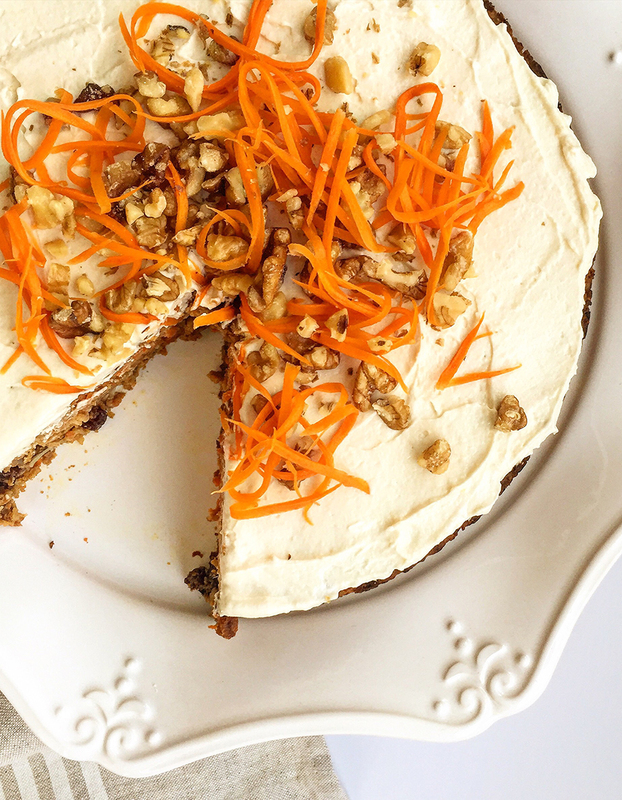 This paleo carrot cake is packed with nutritious ingredients, so if there was ever a cake that made you feel virtuous eating it, it’s this one. Please keep in mind, however, that because it’s made without flour, sugar or dairy, this cake tastes very different than a conventional store-bought carrot cake. Delicious, but different. Deliciously different. Thick, moist, rich, fruity and dense! NOTE: This recipe has been reworked (for the better, in my opinion) on June 8th, 2015. 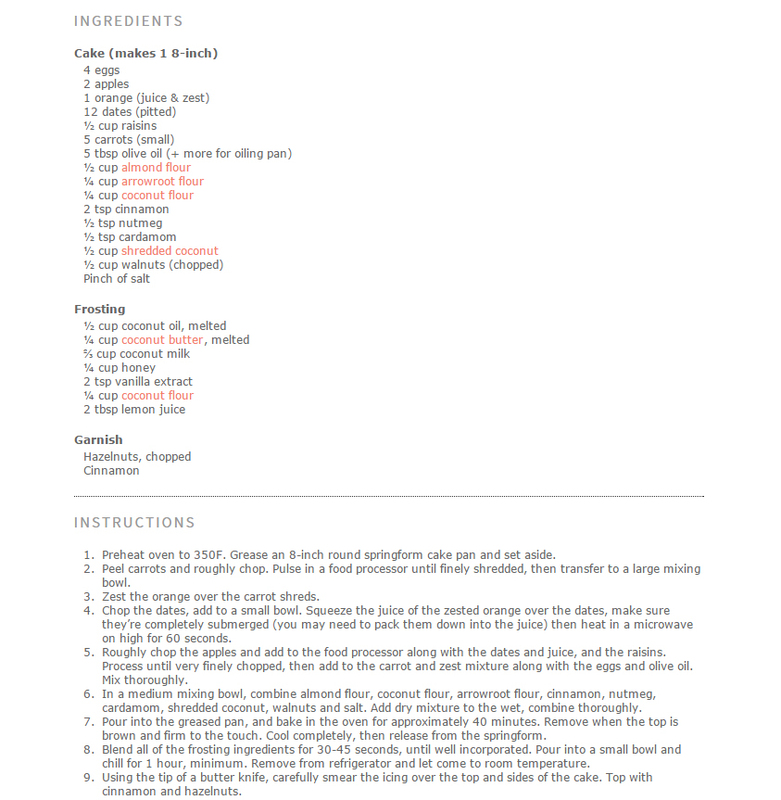 However, if you were a fan of the recipe in its previous incarnation it can be found here. This delicious, naturally-sweetened, grain-free treat is packed with carrots, fruit, nuts, coconut, and spices. Preheat oven to 350° F. Grease a 9-inch round spring-form cake pan, line the bottom and sides with parchment paper and set aside. Roughly chop the carrots, core and roughly chop the apple. Load both into a food processor, and add the zest and juice of the orange, the chopped dates, raisins, walnuts, eggs, coconut milk and coconut oil. Puree until the vegetables and fruit are shredded and fully incorporated into the other ingredients. In a large mixing bowl, combine almond flour, arrowroot flour, coconut flour, cinnamon, nutmeg, cardamom, shredded coconut and salt. Stir the wet mixture from the food processor gradually into to the wet until a thick batter has formed. Spoon into the greased and lined pan, and then bake in the oven for approximately an hour. Remove when the top is brown and firm to the touch. Cool completely, then release from the spring-form pan. To make the frosting, whip the frosting ingredients until smooth. To make the garnish, combine the honey with 3 tablespoons of water in a small saucepan. Using a potato peeler or method of your choice, shred a few handfuls of carrot curls. Add to the honey mixture in the pan, and bring to a simmer. Cook, stirring occasionally, at a simmer for 3-5 minutes until the carrot curls are softened. Remove to a paper towel-lined plate to cool and drain. Using a butter knife, smooth the frosting thinly over the top and sides of the cake. 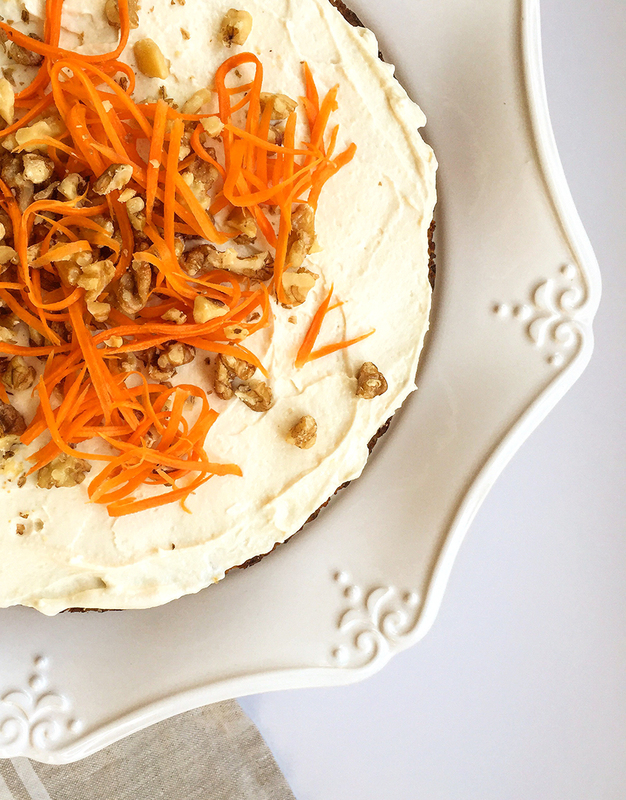 Pile the cooled carrot curls and a handful of chopped walnuts on top of the cooled cake, and serve room temperature or chilled. The frosting is very workable at room temperature, it firms up considerably when chilled. It tastes dangerously good! The dates really sweeten the whole thing tremendously. That cake looks soooooo good!!! Thank you! I’ve found that Paleo cakes often suffer from structural issues, but this guy is just clean cut and solid with a nice texture. Firm enough to ice without breakage or crumbs, too. This looks fantastic! The icing looks pretty firm, how workable was it? Paleo icing is a code I have yet to crack. The icing is not as easy to work with as a buttercream, but it took me only half an hour to ice this cake (which I thought was reasonable, all things considered). I chilled the icing thoroughly, iced about half the cake, then popped it in the microwave for 10 seconds to loosen, stirred, and finished. You may find it workable straight from fridge, however! That sounds great! Especially the fact that you found the need to loosen it! The few paleo icings I have tried were too runny to begin with. Yay! I love Luise & David’s blog, so thanks for Paleo-fying this recipe. Can’t wait to make it. This looks delish!! I have an allergy to Almonds, wondering if this recipe would work with coconut flour or another gluten free, wheat free flour? Looking forward to making this!! Question about the carrots. Ingredient list says grated but instructions say to chop. Do you chop the grated carrots? Ah, I see what happened. I listed them as grated and then ALSO gave instructions for grating them. Whoops! It was mush after 40 minutes of baking. I kept checking and finally took it out after 1 ½ hours. I think part of the problem was that it called for zest and juice of 1 orange What size orange??? Obviously, mine was larger than the one used. Better to give measurements and say ½ cup fresh squeezed oj and 1 T orange zest. I was able to frost it, since the outside was firm enough, but when you cut into it, it crumbled. The frosting broke and was not smooth. I think this was due to the coconut flour, which IMO wasn’t necessary. With all the coconut oil and butter, once it was chilled it would be quite firm. I would not make this cake again. But I would try another from the list of Paleo carrot cakes I got it from. If all else fails I will Paleoize my favorite Silver Palette Cookbook carrot cake recipe. I have reworked the recipe with a substantially longer cook time! thanks for PALEO CARROT CAKE and health review.. this is very helpful. hi! can i omit the walnuts? Best to replace with a different kind of nut, or more coconut.